With Paris Saint-Germain winning the French league title over the weekend with 8 games remaining on the schedule, a few things became clear. First, of course there is no one in the French game that can compete with PSG's deep pockets. And secondly, the fact that forward Zlatan Ibrahimović and full-back Maxwell may just be one of the most interesting partnerships ever created on the football pitch. Brazilian left-back Maxwell and Swedish international football icon Zlatan Ibrahimović have enjoyed illustrious careers, most of which they spent with the same clubs. In 2001 the duo joined Dutch side Ajax, each coming from their first domestic professional side. Fifteen years later and the two have shared four clubs, all while picking up a whopping twenty four trophies together. 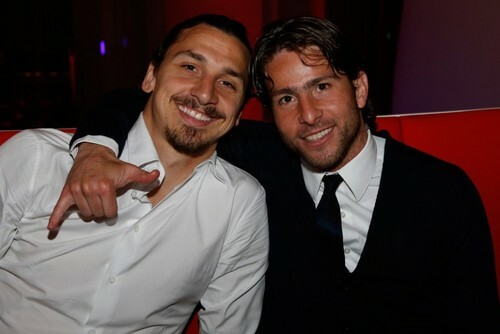 Zlatan would go on to leave Ajax two seasons before Maxwell made his move to Italy with Internazionale. Nonetheless, before they would meet again at Inter they had already celebrated the Dutch Eredivisie title twice and the KNVB cup as well. After two seasons with Italian club Juventus, Zlatan joined Inter in 2006, as did his old buddy Maxwell from Ajax. Together, the two would go on to win the Italian league title in three consecutive years between 2006 and 2009, along with two wins of the Supercoppa Italiana. Both Zlatan and Maxwell would go on to sign with Barcelona in 2009, and just like at their time with Ajax, it would be Zlatan who left first, signing with AC Milan first on-loan just a year later, then on a permanent transfer a year after that. But despite such a short stint for the Swede, the two managed to collect more trophies than they managed together at any of their previous clubs. A total of five trophies included a La Liga title, two Spanish supercups, a UEFA Supercup and a FIFA Club World Cup championship. In 2012 the two would meet again, this time at their current club Paris Saint-Germain. Since arriving in France less than four years ago, the two have enjoyed 10 additional titles by winning the French league four times, the French supercup (Trophée des champions) three times, League cup twice and the French Cup once. Both Zlatan and Maxwell are now 34 years old and are nearing the end of their footballing careers. But if they were to move on from their current French club, would they meet again?